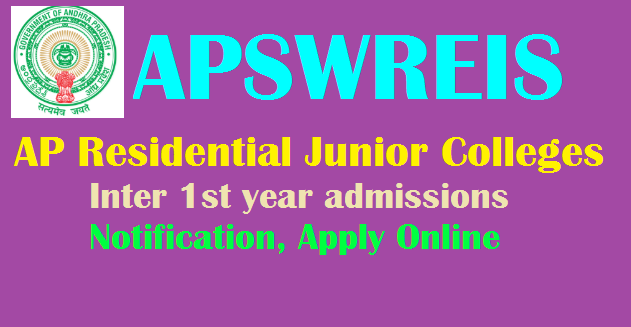 APSWREIS INTER CET 2019 APSWREIS (AP Residential Jr college) Inter 1st year admissions 2019 notification, APSWREIS JR COLLEGE CET 2019 Inter entrance test Apply Online APSWREIS Inter notification 2019, apswr Jr college admissions : apswr jr college notification 2019 is released , APSWREIS Inter 1st year admission notification 2019 Pdf available for the Academic year 2019-2020 on web portal apswreis.cgg.gov.in, apgpcet.apcfss.in/Inter APSwreis Junior Inter Admissions, APSWR Junior Colleges Admissions, APSWRJCs Junior Inter Admissions, Last date to apply for AP Social Welfare Inter 1st year admissions, Download Junior Inter admissions application form, Eligibility criteria, Selection list (Results) Announcement date, Counselling date and other details given here. Andhra Pradesh Social Welfare Residential Educational Institutions Society(APSWREIS) has given the Intermediate 1st year admissions 2019 notification on March-2019 and applications are invited from the SSC passed students in first attempt in March 2019 for admission into 1st year intermediate in 163 apswr Junior Colleges for the academic year 2019-2020. The following guidelines are communicated to the students regarding apswreis notification 2019 applications, merit lists and apswr jr college counseling. A copy of the apswreis inter 1st year application form and apswr jr college list , subjects and medium available and No. of seats are herewith appended and also placed in society Website. May be this year, officials will receive applications through online mode only and conduct admission test. We may again continue with APSWREIS Inter admission hall tickets 2019 and APSWREIS Inter admission results 2019. Interested candidates can register for APSWREIS Inter admission 2019 before the link expires. apswr jr college Online application form starts from 11-03-2019 ; Application End Date : 26-03-2019, Interested candidates can fill the apswr jr college admission 2019 Application Form from the official website apswreis.cgg.gov.in. Don’t wait for last minute send the apswreis application form before 26th March 2019. The candidates can obtain application form duly downloading from the website http://apgpcet.apcfss.in/Inter/ The candidates can submit filled in applications at APSWREIS Intermediate Registration opened last date:26-03-2019. The list of 163 APSWR Junior Colleges with groups, sanctioned seats for the academic year 2019-20 is enclosed herewith as Annexure-B. for applying to the Junior Colleges. The list of counseling centers is enclosed herewith as Annexure-C. Candidates can check apswreis admissions 2019, AP Residential college apply online last date, ap gurukulam 1st year application form 2019-2019, inter merit list 2019, selection list, inter 1st year selected student list 2019, counselling schedule, notification 2019, Inter notification 2019 through this website. Eligible candidates will be informed to attend apswreis inter admission counseling at helpline centers on May , 2019 at 10.00 am. The list of selected students along with the waiting list, will be displayed on the Notice Board on 4th June, 2019 at 10:30 A.M. APSWR Jr Intermediate classes for the selected students will commence from June 2019.